Generally speaking, trends in the forage industry develop at a sluggish pace. There are probably good reasons for this lack of alacrity. It takes time for technologies to develop and even more time for early adopters to prove to the rest of the world that a practice or product either works or doesn’t. A case in point is baleage. The concept of individually wrapped, high-moisture bales has been around for a long time. Widespread usage has not, at least until recently. Baleage has gone from the offbeat to the mainstream in most humid regions where dry-bale making can inflict excessive hair loss due to frustration, especially during wet seasons. With its popularity have come advances in machine technologies and also a wealth of research studies to help document our understanding of the unique challenges posed by the harvest and fermentation of longer stemmed forage. Recently, Penn State University forage specialists Marvin Hall and Jessica Williamson reported on a study that they completed evaluating the effect of bale density on baleage fermentation and bale quality. Using four different balers set for maximum density, experimental bales were made while operating each baler at three different speeds (4, 8, and 12 miles per hour). All bales were wrapped within four hours of being made using a minimum of six layers of 1-mil wrap to exclude oxygen and to keep bale temperature below 120°F. Thermocouples were placed inside each bale to monitor bale temperature. A low pH is desirable in any forage fermentation to help ensure long-term stability. Once oxygen is eliminated from the system, anaerobic bacteria convert plant sugars to organic acids such as lactic and acetic. It’s this build up of acids that help lower the pH. 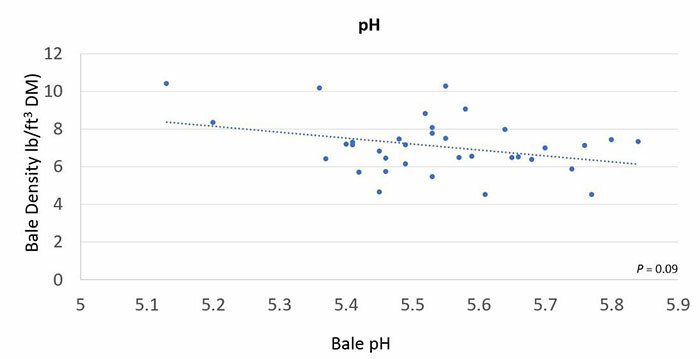 The relationship found in the Penn State study between bale density and pH is presented in Figure 1. The researchers reported that both acetic and lactic acid concentrations were greater in bales with higher densities. Following 28 days in storage, the bales were unwrapped to assess their bunk life. A bale was considered spoiled when it reached 2°F above the baseline temperature of the bale. Bales that were denser held their bunk life the longest (see Figure 2). The results of this study clearly indicate the advantages of making a dense bale when it will be stored as baleage. However, the Penn State specialists are also quick to point out that other steps need to be taken if a quality end product is desired. Most importantly, baleage needs to be harvested between 45 and 60 percent moisture. This will help promote proper fermentation. Harvesting a little above or below this range requires that two extra layers of wrap be applied to help ensure oxygen exclusion. It is not recommended that baleage be made when the forage is over 70 percent moisture. 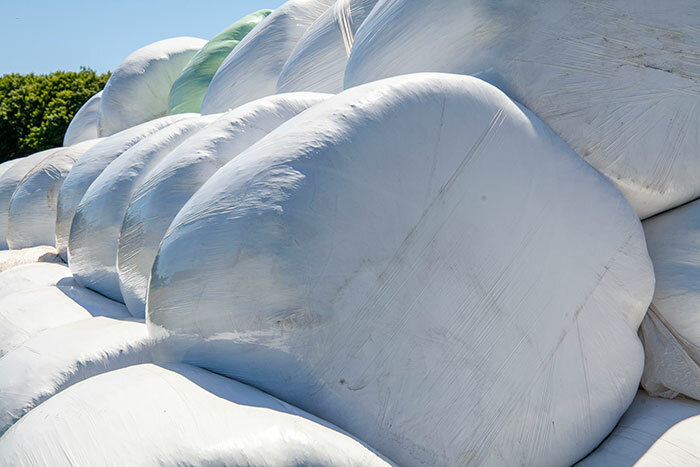 To inhibit bale temperatures from rising above 120°F, the forage specialists recommended that bales be wrapped as quickly as possible after baling. This minimizes the amount of protein degradation caused by excessive heat. of 1-mil plastic) should be applied to each bale, but eight wraps is preferred,” they added. Finally, as is the case with any forage storage system, baleage yield and quality will hinge on when the crop is harvested. The optimal harvest time is dependent on the livestock class being fed. There is little question that baleage will continue to gain in popularity across our more humid regions. With more farm experience and research, our knowledge base on the process will continue to grow. 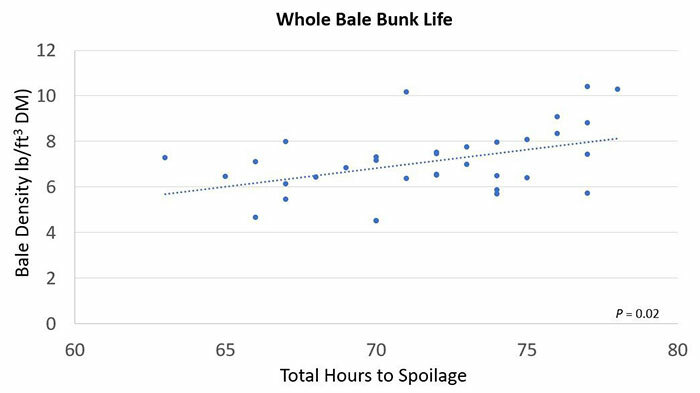 From one Penn State study, we can now conclude that making a dense bale must be added to the priority list of “must do” items for optimal baleage production.